Here are some information about the height of Zayn Malik. Zayn Malik is a British singer and performer. Zayn was born in West Lane, Baildon, Bradford, England on January 12, 1993. Malik is one of the members of One Direction. The height of Zayn Malik is 5ft 9in, that makes him 175cm tall. Zayn Malik's height is 5ft 9in or 175cm while I am 5ft 10in or 177cm. I am taller compared to him. To find out how much taller I am, we would have to subtract Zayn Malik's height from mine. Therefore I am taller to him for about 2cm. 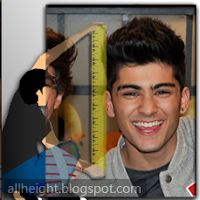 And see your physical height difference with Zayn Malik. Everyone is loving this One Direction guys. Hope you like our posts about their height. Is Harry Styles really 6ft tall now? Based on the images that we see, his height can't be no more than 5 feet 10 inch. zayn is 5,9 and i am 5,0 so he would be purfect for me to date!!!!!!!!!!!!!!!!!!!! Yes, I think Zayn is taller now. His height now I think is 5'10". hey can we get married, like your height is perfect lol, and i'm 5.4.